Mounting marine antennas can feel overwhelming. 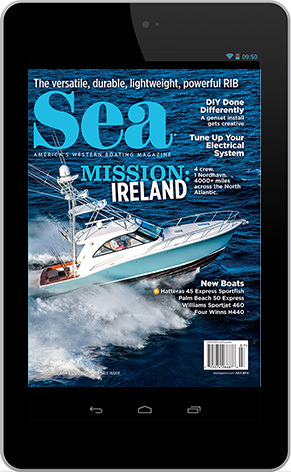 The proliferation of electronic systems that populate the wheelhouse of today’s recreational vessels have one thing in common: most of them have an antenna connected. This can cause a shortage of topside real estate for mounting all the antennas in a way that they don’t cause radio frequency interference (RFI) with one another. The smaller the vessel, the more difficult it is to find sufficient space to mount all the antennas. 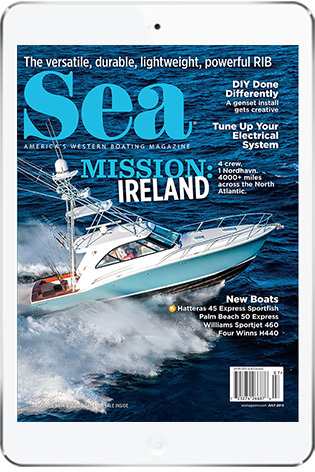 The good news is that the smaller the boat, the less cabling an owner will use in connecting an instrument to its antenna, which means it will be easier to install and will have less attenuation of the signals. What constitutes appropriate separation for boat antenna to ensure interference from one system to another? The answer for proper vertical and horizontal antenna separation can be complex, but there are a few rules that will help ensure maximum performance. What we see in the photo above is really pretty marginal, at least based on NMEA’s own installation standards. According to the standard, satellite TV antennas should be three feet away from VHF antennas and GPS antennas, and VHF antennas need to be no less than three feet away from GPS antennas. So, with the pictured installation, it looks like we might have an issue with the GPS and VHF separation, and the sat TV is a little tight with both the VHF and GPS. This is a common problem due to limited amount of real estate on most boats. So, do we have a problem here? Maybe, maybe not. Antenna isolation or separation is a key consideration when laying out an antenna field. Sufficient isolation is required to ensure that interference between systems is kept within acceptable levels — levels at which the equipment can operate effectively. A number of techniques for achieving isolation between systems exist. The two most common and straightforward approaches are horizontal and vertical separation. Horizontal antenna separation is when the amount of signal coupled from one antenna to another is reduced as a function of distance. One way of achieving this isolation is through antenna separation in the horizontal plane.Vertical antenna separation is a more efficient method of achieving the required isolation in space-constrained environment. Vertical separation provides significantly more isolation than horizontal separation.Inverted mounting of an antenna is another method often used to conserve tower space or to provide RF isolation (typically utilized for omnidirectional whip antennas). It will help in the proper placement of antennas if we understand how radio frequencies interfere with each other in a sort of RF interference hierarchy. First we need to know that VHF and GPS can both interfere with each other and that radar and HF can interfere with just about anything electronic. Because GPS receivers need a clear view of the sky, their antennas should be mounted in a clear area topside at a reasonable distance from any VHF, which should not be a problem because VHF antennas should be mounted as high as possible due to the line-of-sight range restrictions, and with VHF, height is more important than power output. The AIS system works on two channels in the VHF frequency range, and in order to receive or transmit AIS information it’s necessary for the AIS unit to be connected to a VHF antenna. One option is to fit a VHF splitter, which allows both the VHF radio and the AIS to use the boat’s main VHF antenna. 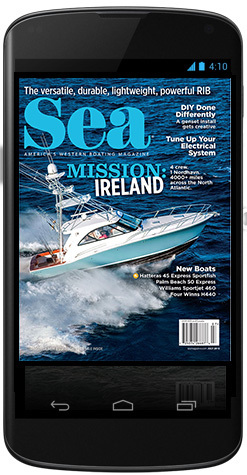 The other option is to fit a second VHF antenna, which is then connected to the AIS. Any VHF antenna can be used, although some antennas are “AIS tuned” to get maximum gain on the two AIS channels and also have a BNC-type connector fitted (common on AIS units), rather than the traditional PL259 VHF connector. If there’s more than one VHF antenna, they should be separated at least one-half wavelength (three to four feet) from each other to avoid the 25 watts of transmit power from the VHF radio going straight into the AIS receiver circuitry, potentially damaging it. It’s always better to move them as far apart as possible or even to stagger them vertically. For antennas that are close in operating frequency (e.g., TV and GPS), spacing can be closer but a general rule of thumb is three feet at minimum. Objects close to a TV antenna will affect its performance. It’s best to locate the antenna at least three feet away from any metal objects or other antennas, keeping as much of the antenna above the metal as possible. The extra height above the water will be a plus in the form of additional reception range. 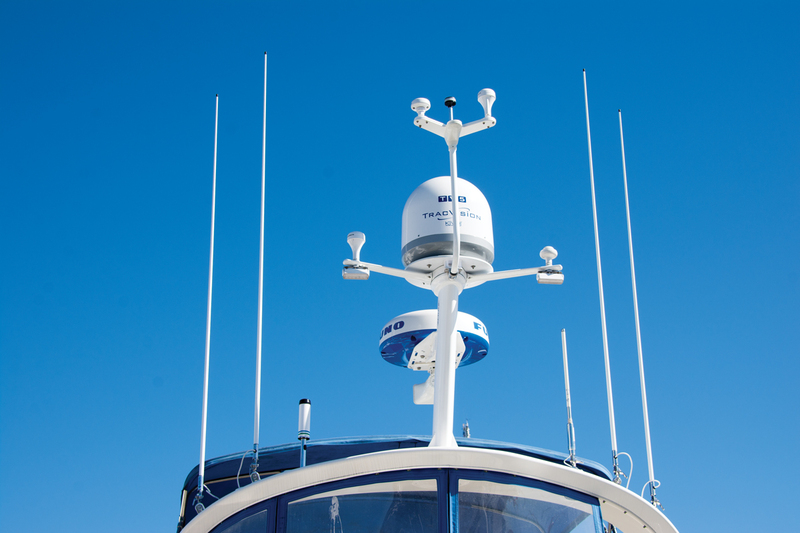 HF antennas can be mounted nicely on each side of the pilothouse.While many cruisers might choose to install their own antennas, a professional can remove any guesswork. Testing of all the systems at once for any cross talk or interference is the only way to know for sure.